As we enter 2015, it is time to reevaluate our websites and bring them up to speed. With millions of websites across the Internet, what are the web design elements that will make your site shine? What will make your site stand out from the rest? Let’s take a look at eight web design trends that you will want to consider. Responsive web design (RWD) will no longer be an option and has become a standard in design. A responsive website is a site that is crafted for optimal viewing on any device from a TV and desktop computer to a tablet and mobile phone. The same HTML code is used for any device and the cascading style sheets (CSS) control the view in any browser it is displayed in. In other words, the website “responds” to whatever device it is viewed in. It provides the viewer with an easy to read and navigate website. With the explosion of mobile device use to surf the Internet and the vast number of different sized viewing screens, responsive web design has become the best practice in design. When Google makes a recommendation, we should listen. Google has clearly stated that the technique of using responsive is the company’s recommended configuration. The company has an entire section dedicated to the web fundamentals at Responsive Web Design Basics. To give your visitors the best experience, the speed of your website is also a major consideration. It is common knowledge that if your website is slow to load, visitors will likely click away. According to Google, a fast loading site will “lead to higher visitor engagement, retention, and conversions”. Google made a strong statement that speed matters in June of 2009. The download speed of your website is one of the 200 ranking factors that the search engine giant uses. To test your website’s speed, please see: Google’s PageSpeed Insights. Should We Say Goodbye to Sliders? Low click through conversation rates. Are often not mobile friendly. Are confusing to visitors because of timing as some are too slow and others too fast. May hurt your SEO initiative due to slow loading. Slow loading sites may lead to visitor’s bouncing away and push your site down in organic rankings. Some sliders also include unwanted H1 tags. While sliders appear to still work on some websites, if you are using a slider, it may be time to check to see if they are helping or hurting conversions. In years past, the web safe fonts including Arial, Times New Roman, Helvetica and Sans Serif were the norm. Designers are increasingly using an array of fonts in larger sizes to enhance the design of sites. Not only are larger, bolder fonts becoming the norm, but background images are too. Full screen media with large background images and videos are becoming popular to connect with visitors. Responsive fonts are taking the spotlight right along with responsive design. Larger fonts ensure that your viewers can read your content. Any aspect on a website will need to be mobile optimized to offer the vast numbers of mobile device users the best viewing experience. There is a growing emergence of flat design. What is flat web design? Flat design is a term coined to describe the design style in which elements do not have design enhancements that help them lift off the page. This includes drop shadows, bevels and gradients that give elements a three dimensional appearance. One popular flat design example is Apple’s website. For more on flat design, please see: Ultimate Guide To Flat Website Design. As we say goodbye to 2014, there are a number of web design trends that will be carried over into 2015. Some will become standard practice, while others will fade away. For example, there has been a popular trend for one page design with parallax scrolling. This involves using HTML5 and CSS3 to create the effect of background images moving slower than foreground elements. While visually appealing, many parallax sites are not SEO friendly. Some are too heavy to be mobile-friendly. We will have to wait and see if this trend continues. While I have included only 8 web design trends for 2015 in this article, there are other trends. 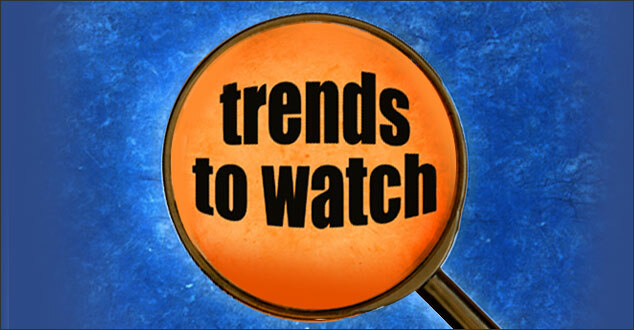 It may be time to take a closer look at our websites and consider what popular trends we might like to try. Ultimately, our goal should be to offer a great user experience and those trends that can help us accomplish that goal should be implemented. What web design trends to you see becoming standard practice in 2015? Do you think any that will fade away? Oh, Robin, this is great information!! You are always on top of things (especially with google). Do you think google will continue to be the top search engine in 2015? I was told the reason my web pages are a bit slow to load is the size of the pictures and that I should make them smaller. Would that help? Gee, thanks!! You’re the best! Happy New Year! Tina, thank you so much for your comment and your email. Yes, I do think that Google will continue to be the top search engine in 2015. I will be happy to take a look at your website and will answer your email within the next few days. Happy New Year! Great information as usual from you! What size font do you suggest for mobile? We use 17pt on the website (we’re getting on a bit – ha ha) but don’t have smart phones. What’s your take on this? I’m so glad to hear that you found this helpful, Caroline. For responsive fonts, I recommend using the scalable unit “em” or percents instead of the fixed px or pt in your CSS. You can use online mobile phone emulators to test your pages like http://www.mobilephoneemulator.com by COWEMO. I hope this helps. Please let me know if you have any more questions and happy New Year! Thank you, Ian! Happy New Year! I agree. Minimalist design with more white space and better visual pathways that lead to calls of action is an emerging trend. There is a challenge with page load speeds for many responsive sites and the trend of larger photos and graphics. Again, happy New Year and thank you for your input! Thanks for these stellar tips! My pleasure, Brooke, Thank you for taking the time to read this article and for sharing your thoughts on sliders. We have a lot to keep our eyes on to see if they become best practices, don’t we? As always, good important info even though I leave this techy stuff to my web developer. It saddens me to hear that sliders are ‘boring’, ineffective, etc. I love pairing our jewelry with images of nature in our 4 seasonal sliders. I think it sets the tone for our website. Thank you, Roslyn. As these are trends and not yet best practices, I think it is safe to say that sliders do work on some websites. Your slider is very tastefully done and it does set the tone for your website. Thank you for stopping by and for your comment. Thank you so much for sharing such helpful information on web information. I just got rid of my slider and am in the process of redesigning my site. You have given me a great amount of things to think about. Thanks so much and happy new year. You are very welcome, Irish. I’m happy to hear that this has been helpful. Thank you for stopping by and happy New Year! Best of success on your website’s redesign.